At the end of Exodus 4 something rather curious happens. Moses and Aaron speak to the elders of Israel, and then they and the elders speak to the people. Now, it’s not speaking to the elders or speaking to the people that’s curious, but rather what happens when they speak to the people, for ‘when they heard that the Lord had visited the children of Israel and that He had looked on their affliction, then they bowed their heads and worshiped’ (Ex. 4:31). What’s curious about that? Not the bowing and worshipping, but the fact that it says that ‘the LORD had visited the children of Israel.’ You see, the LORD (the Angel of the LORD, so God the Son) had only appeared to one person – Moses. Jesus had met with Moses in the burning bush. The LORD had met with Moses, but the text says the LORD had visited the children of Israel. Now, the people hear about this after Moses and Aaron speak to the elders. So it’s talking about the LORD meeting with the elders. Yet when we read about that meeting between Moses, Aaron and the elders, we don’t read about any burning bushes or any other appearances of the Angel of the LORD. Moses is the only one who’s seen Him, and yet the people hear He’s met with the elders. How can that be? So, how did the LORD meet with the elders of Israel? Through the proclamation of His Word. And that wasn’t a one off for the elders in Egypt. He meets with His people still today as the Word of Christ is proclaimed. Preaching isn’t just telling people about God. Preaching is holding out Christ, the Living Word. And as Christ is proclaimed, Christ is present meeting us in the preaching of His Word. P.S. 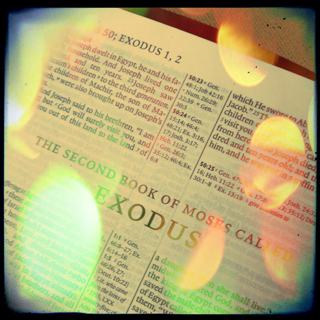 Here’s a sermon on Exodus 3-4 and what happens when the Angel of the LORD meets with Moses and the children of Israel. There's no such THING as grace!